Battle for Mosul – what is next for Iraq and the Islamic State? On the night of 16 October 2016, the long-awaited offensive in Mosul began. Situated in northern Iraq, and with more than 2 million mostly Sunni inhabitants before the war, the city became in early summer 2014 a symbol of the weakness and collapse of the Iraqi state. Fewer than 2,000 Islamic State (IS) militants managed to take it over in a matter of hours almost without firing a shot, despite the fact that almost 70,000 Iraqi soldiers and officers were defending themselves throughout the entire province of Nineveh. Now the soldiers of the Iraqi army have the chance to take revenge on the Islamists of the caliphate for the humiliation and defeat experienced over two years ago. They have the support of the Iraqi Kurds, as well as paramilitary Shiite, Sunni and Christian formations, mostly grouped under the banner of the People’s Mobilization Forces (Al-Haszd ash-Sza’abi). The list of entities involved in the Mosul operation is indeed much longer. There are both the official Iraqi government allies (including the United States and other member states of the IS combat coalition), as well as unofficial allies, in the form of instructors from the Iranian Islamic Revolutionary Guard Corps and the experienced soldiers of Lebanese Hezbollah. As for the fight for Mosul (and, implicitly, for the future of Iraq), there are also other players involved such as Russia and Turkey, which has had its military base in Iraqi Kurdistan for more than a year, and has recently joined the raids on IS positions in northern Iraq. The battle to regain Mosul is a serious military challenge. This is especially the case operationally for the government of Iraq and the coalition, mainly due to the very nature of the activities awaiting coalition forces, i.e. the persistent, long-lasting fighting in densely populated urban areas. In such conditions, it is easy for the determined and fanatical enemy, which the Islamic State undoubtedly is, to successfully defend for a long time. This is especially true when considering that (as information coming from Mosul indicates) in recent months the Islamists have transformed the city into a real fortress, creating a complex and deeply set defence systems, with minefields and separate points of resistance, guarded by special units composed of shahid (suicide bombers). IS formations employed to defend Mosul total at least 6,000 fighters (and according to some sources – up to 12,000), mostly experienced veterans, determined to fight to death. The first hours of the offensive fully confirmed the fears of many experts and analysts that the regaining of Mosul would be neither easy nor fast. Although there is no doubt that the final outcome of the operation, started on October 16, would be beneficial for the coalition and the government in Baghdad, an increasing number of voices are claiming that the whole action could take several months. The coalition may also have problems deriving from the diversity of the forces participating in the campaign against IS in Mosul. Some of these entities have shared mutual animosity (and often overt hostility). Therefore, any closer coordination of their activities during the operation would be extremely difficult, if at all possible. This has raised the risk of reducing the effectiveness of combat operations against the IS, as well as the emergence of serious military and political complications, impacting negatively the operation and the overall political situation in Iraq. This context has had a negative impact on the strategic dimension of the Mosul operation. Its aim is, after all, not only the regaining of Mosul – the second largest city in Iraq – but also striking a serious blow to the caliphate through the actual liquidation of its Iraqi part. Regaining Mosul has the same importance in the fight against IS as a whole (and not only in the Levant), and goes far beyond the narrowly perceived dimension of politics and the situation in Iraq itself. Meanwhile, the battle for Mosul, along with the question of its future status in post-war Iraq, has already become the subject of political rivalries between the coalition’s multiple participants. This competition is taking place on several strategic levels, both inside Iraq, as well as on a regional level. 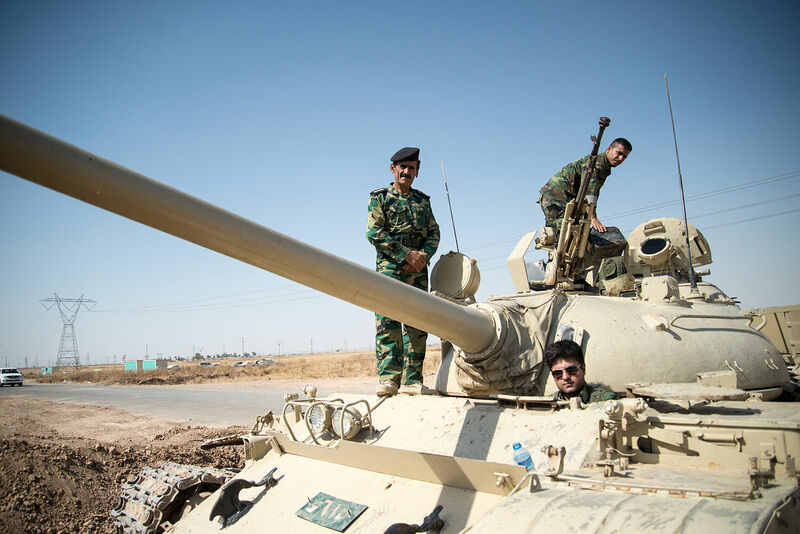 The developments in Iraq in the last two years have resulted in the Iraqi Kurds in the north of the country becoming a force capable of effective and durable resistance against the threat from the Islamic State. Furthermore, over the past several months, the Kurds were able to gradually recover territory from the hands of IS. Today, the Kurdish Peshmerga (members of the armed formation subordinate to the authorities of the Kurdish autonomy in Iraq) are an important force in the Mosul operation, without which, in fact, it would be difficult to imagine the success of the whole action. Such a reality, however, is not accepted by Iraqi Shiites (representing the majority population of the country), who claim the right to decide for themselves the future of not only the region of Mosul, but Iraq as a whole. The People’s Mobilization Forces, dominated by Shiites, and their political supporters in the form of numerous religious parties, have been openly seeking to transform the country into an Islamic republic modeled on Iran. The ideal for them is the Iranian political and systemic doctrine (velayat-e-faqih) according to which, there is no room for autonomy of the Sunni or Kurdish areas or any form of their exclusion from the authority of the Shiite ayatollahs. In their view, Mosul must, therefore, be regained from the hands of IS mainly by Shiite forces because only this would guarantee the future homogeneity and territorial cohesion of Iraq, understood as the full sovereignty of the government in Baghdad. For their part, Iraqi Kurds have no illusions that their participation in the liberation of Mosul would provide them with any future territorial gains in this part of Iraq. Before the advent of the caliphate and the outbreak of the current war, the Kurds were a tiny minority in the province of Nineveh and its capital city of Mosul. Therefore, they have no historical claims to the region. The participation of Peshmerga in the ongoing offensive is therefore more the result of the aforementioned strategic coincidence which emerged in the past two years, rather than self-serving action, calculated to achieve the territorial benefits in northern Iraq. This does not change the fact that the important role of Peshmerga in the current operations in Mosul may help Iraqi Kurds in future negotiations on the status of Kirkuk region, which is also claimed by the Arabs. In this sense, Kurdish involvement in the battle for Mosul has a specific political context, and its main goal is not only to destroy the deadly threat of IS, but also act to consolidate the territorial gains made by the Iraqi Kurdistan in areas to the east of Nineveh (these areas, although historically Kurdish, in the past few decades have been the target of intense settlement by the Arabs, now giving them the basis to assert territorial claims). There will therefore be no exaggeration to say that the ongoing battle for Mosul is essentially a battle for the future distribution of influence and power in northern Iraq, and indirectly throughout the country. The weakest side, and therefore almost a certain defeated side in this game are those who have inhabited the city and its region for centuries, i.e. Sunni Arabs, and Yazidis and Assyrians (of various Christian confessions). The recently launched Mosul campaign is also a field of intense strategic competition between the key players in the Middle East region, concerned about the future shape of the political system and political life of Iraq. The most active actors in this field include Iran and Turkey (the latter has recently replaced Saudi Arabia in this role, which was weakened by the prolonged involvement in the conflicts in Yemen and Syria). For Iran the involvement in Iraq, and the battle for Mosul in particular, is an opportunity to show to the world its capacity for projecting its own geopolitical interests. Nobody denies the fact today that the Iraqi Shiite paramilitary units gained their military and political power almost exclusively thanks to the commitment and support from Iran. With its overwhelming influence on Iraqi politics (with the government at the helm), society, media and the economy, Iran is now hoping for a final transformation of Iraq into a country subordinated to the strategies and political vision of Tehran. Thus, the battle for Mosul, and in the near future the defeat over IS in Iraq, is an opportunity for Iran to further strengthen its influence in Iraq and throughout the region. From the perspective of Tehran this game takes place in parallel in Syria and Yemen, which have the same geopolitical significance for Iran as the issue of Iraq. The battle for Mosul needs to be won by those forces that represent the interests of Iran in Iraq i.e. the Shiites. This means that any success of either the Sunni (supported by Turkey) or Kurds would be unwelcome, and might be met with relevant political counter measures of Iran and its Iraqi protégés. In this context it is no coincidence that a rapid cooling of diplomatic and political relations between Baghdad and Ankara could be observed as early as the third day of the offensive in Mosul. Nor is it accidental that the Iranian security forces have intensified ‘anti-terrorist’ operations, taken recently in western Iran against the local Kurdish guerrilla. For Tehran the issue of Kurdish separatism continues to be a more significant threat than the IS and its caliphate. Turkey for its part, seeks to take over the government of souls and the political patronage of the Sunni community in Iraq – currently a minority threatened by mass repression from the Shiite majority undertaken under the pretext of the fight against the IS. The battle for Mosul, currently the largest Sunni city in Iraq, has special significance here: whoever governs it possesses the key to the areas of the country inhabited by Sunnis. However, from Turkey’s perspective the game is also played in order to torpedo Kurdish dreams of sovereignty. Ankara would never agree to the construction of sovereign Kurdistan in northern Iraq, knowing that it would mean an escalation of independence aspirations of Turkey’s Kurds. On this, and perhaps on this alone, Turkish interests coincide with Iranian, Iraqi, and even Syrian (the government in Damascus) ones. The offensive on Mosul launched in mid-October 2016 is, apart from the purely military dimension, the intensification of political rivalry inside Iraq about the future shape of the constitutional and territorial development of the country. Each of the entities involved in the operation on the side of the government (the Shiites, Kurds, Sunnis and Assyrians) raises hopes for the realization of its strategic objectives, often far-reaching (for example Assyrian autonomy plan for the area of Nineveh). Generally the goals and interests of individual groups and communities are contradictory and mutually exclusive, which raises serious concerns about the future of the political situation in Iraq after the end of the campaign. In this sense, the victory over the IS in Mosul would not mean stability in the country, on the contrary, a further increase in tensions should be expected between Arabs and Kurds and between Shiites and Sunnis. The Battle for Mosul is also an opportunity for regional powers involved in Iraq to intensify efforts to achieve their goals regarding the state and the region. In this aspect, the geopolitical interests of the majority of Iraq’s neighbours are, however, contradictory, which makes the country a playing field for Iran, Turkey and (to a lesser extent) Saudi Arabia. Recent months have showed a clear increase in influence of third parties on the situation in Iraq and it is expected that this situation would continue after the regaining of Mosul, which may, however, result in further destabilization of the internal situation in that country. This fierce battle for the second largest city in Iraq is also a struggle for the survival of the Islamic State and the caliphate. The fall of Mosul and Nineveh province would mean for IS the actual loss of almost total ownership in Iraq and serious damage to the existing image. Furthermore, it would be another big defeat for the IS, after the recent loss of the strategic areas in northern Syria, with the town of Dabiq at the helm, in a relatively short time. Despite this, one should not expect, however, that the IS, as a result of these failures, would find itself in a state of crisis or even disorganization. The position of the organization is still strong, especially in Syria, and the propaganda and ideological influence of the caliphate would not be reduced in the foreseeable future.